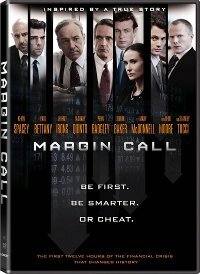 Margin Call (Lionsgate) accomplishes something that Oliver Stone failed to show in his “Wall Street” sequel: it explains how and why the market crash happened, not just in terms of economics but in the culture of Wall Street and the justifications that individuals tell themselves in order to follow the company line. Written and directed by J.C. Chandor, whose fictional portrait echoes the real-life activities of Leman Brothers in 2008, “Margin Call” is not played for tension, tragedy or melodrama. This is not “Glengarry Glen Ross,” with venal salesman and savage banter. Chandor is more interested in the banality of greed and opportunism and the ease in which principled employees are swayed to engage in unprincipled acts. If they don’t do it, someone else will. The film has been criticized as an apology for the people behind the market crash, but I don’t see Chandor’s sympathy for the various individuals on display — notably Kevin Spacey as a career company man disgusted by the corporate behavior — as any kind of apology. I see it more as a social study, a kind of fictional ethnographic profile of the corporate culture, with characters more suggested than fully fleshed out. It’s to the credit of the actors, from Spacey and Zachary Quinto (as the young risk management officer who finally figures out the Achilles heel of their highly-leveraged position) to Paul Bettany, Simon Baker, Demi Moore and Stanley Tucci as the corporate professionals who put the company — and, ultimately, the entire American financial system — on the precipice. Chandor underplays the human drama and the anonymity of the Wall Street office building so much it risks slipping into doldrums, but the stakes are too great and the actors too sharp to let that happen. Along the way, Chandor shows us not just how it happened, but why it’s destined to repeat itself. Quietly, without editorializing, he reveals an increasingly familiar pattern: the people who had nothing to do with the crisis, and even those who predicted it and were ignored, are fired after it comes crashing down, while the folks who let it happen are kept on to see how they can turn this crisis into profit. The DVD and Blu-ray both feature commentary by writer/director J. C. Chandor and producer Neal Dodson, two deleted scenes with optional commentary and the brief featurettes “Revolving Door: Making Margin Call” and “Missed Calls: Moments With Cast and Crew.” Also on Digital Download and On Demand.